Product code: ES3884 Categories: Sold Items, Sold Rings. 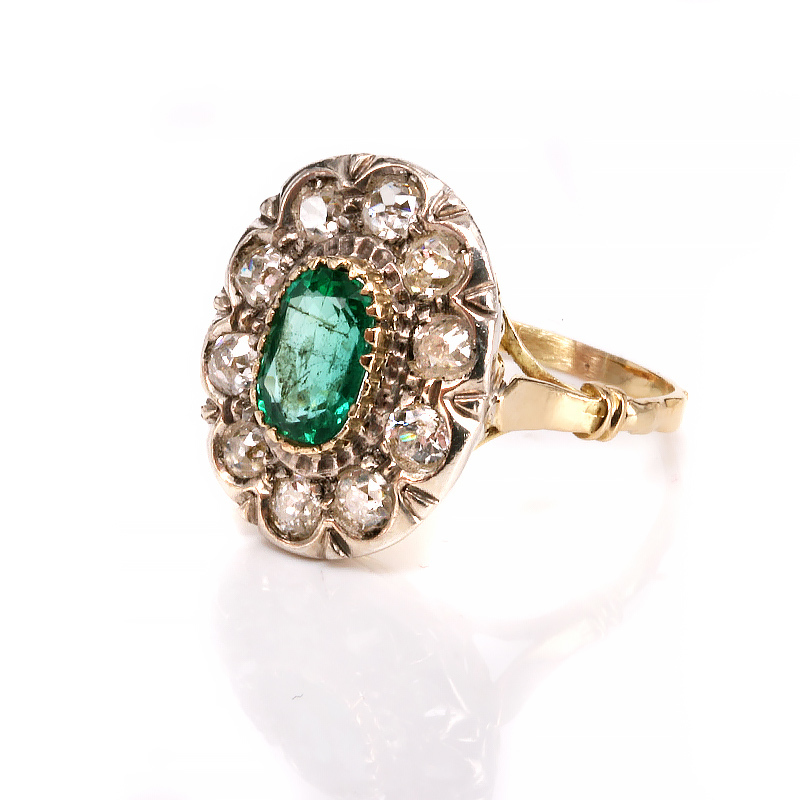 Here is a stunning antique emerald and diamond cluster ring from the Victorian era that has such a presence on the finger and will certainly be admired and appreciated every time that it is worn. Beautifully hand made in 18ct yellow gold and silver around the diamonds, silver was used as it was known that the yellow from the gold can tint the diamonds yellow so silver was used as platinum was not yet used in jewellery and white gold was not to be invented until the early 1900's. Cluster rings always look beautiful on the finger and this one measures an impressive 17.1mm wide by 20mm in length and is really accentuates the hand so well. In the centre is a beautiful natural Colombian emerald which measures 1.30 carats. Colombian emeralds have long been regarded as the finest in the world thanks to the beautiful colour and transparency both of which this emerald displays. Surrounding the emerald are ten old cut diamonds that total 1.50 carats and really add an immense amount of sparkle to an already incredible ring. With beautiful work not only around the emerald and diamonds but also under the ring, this gorgeous antique emerald and diamond cluster will always be loved and admired. 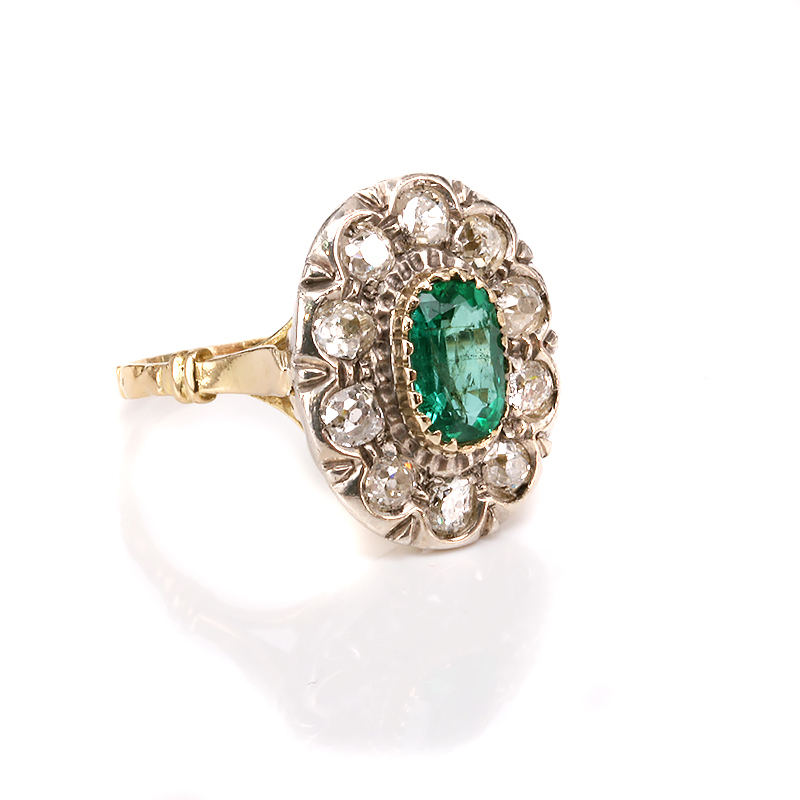 Tag: Antique emerald and diamond cluster ring.